The SSB transmit-stage is implemented in a completely digital and software-based manner: at the heart the ATMEGA328 is sampling the input-audio and reconstructing a SSB-signal by controlling the SI5351 PLL phase (through tiny frequency changes over 800kbit/s I2C) and controlling the PA Power (through PWM on the key-shaping circuit). In this way a highly power-efficient class-E driven SSB-signal can be realized; a PWM driven class-E design keeps the SSB transceiver simple, tiny, cool, power-efficient and low-cost. 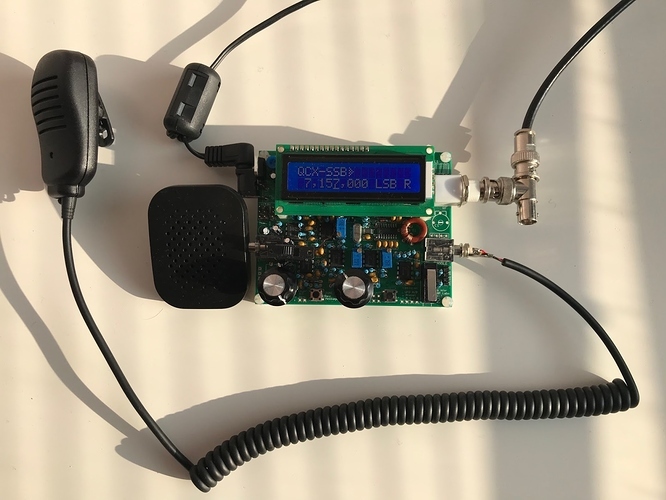 Of course you know that QRP Labs are about to release the QSX - The SSB version of the QCX but it also has a major set of built-in tools as well. We are all eagerly waiting the QSX release ! I need more bands and modes that my 40m QCX ! But what PE1NNZ has done is really amazing !